TBRC are proud to launch our new logo. 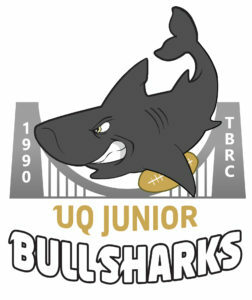 Following the historic formation of our joint Venture with UQ Rugby, one of Brisbane oldest and most successful rugby club we will now be known as the UQ Junior Bull Sharks. We will be changing our playing colours, and our name but or ethos of Fun, Friendship and Community remains unchanged from the very first day a small group of community members started this great club back in 1990. The new logo is very similar to our previous one, Walter the Bull Shark remains of course and we have added to our identity by including the TBRC and 1990 to the famous Walter Taylor Bridge.